Q&A: Mixed Media – Sarah Nguyen | Paint. Draw. Blend. Announcing New Set + Giveaway! We met Sarah Nguyen in our home town (Kutztown, PA) in January at the opening of her show at the New Arts Program. 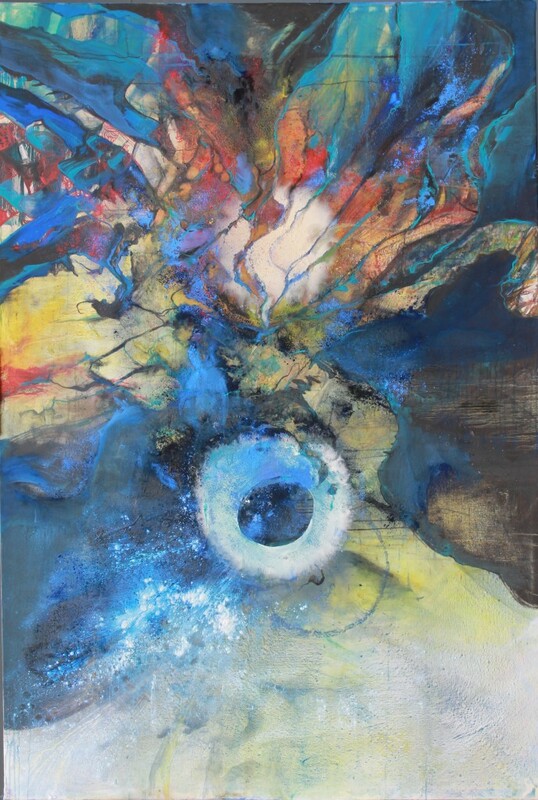 She incorporates PanPastel in many of her beautiful mixed media pieces. I invited Sarah to share with us more about her work, and her creative process. I have always made art. As far back as I can remember I was drawing or painting. At 14 my grandmother, a Yale Art graduate who was trained by Albers, trained me. One of my first successful pieces at that age was with pastels. It was a medium I fell naturally into. I pursued my BFA in Illustration at Rhode Island School of Design and my MFA at The University of the Arts in Philadelphia. 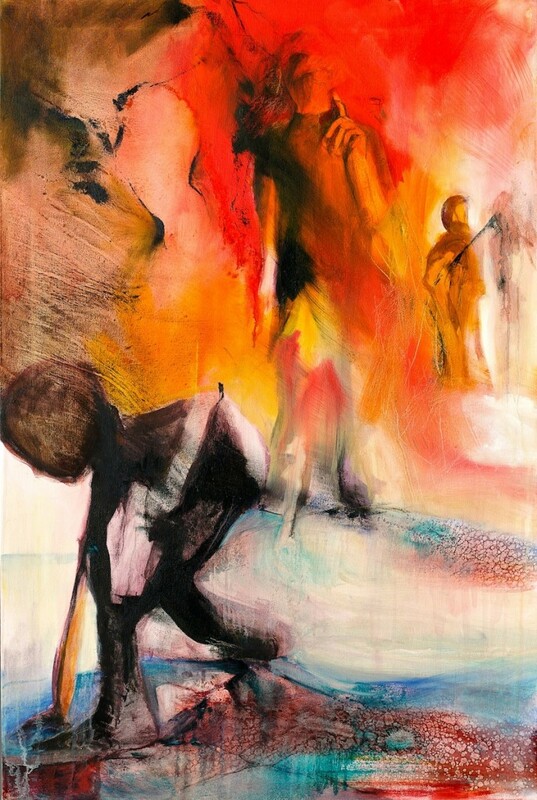 Using modern mediums and techniques, I render each subject then allow forces such as gravity, chemical interaction, and random chance to take over and dissolve the forms, reflecting the occasional dissolving of boundaries between dreams and waking life, and between self and other, that we experience when engaged in universal human activities such as play, ritual, and art. 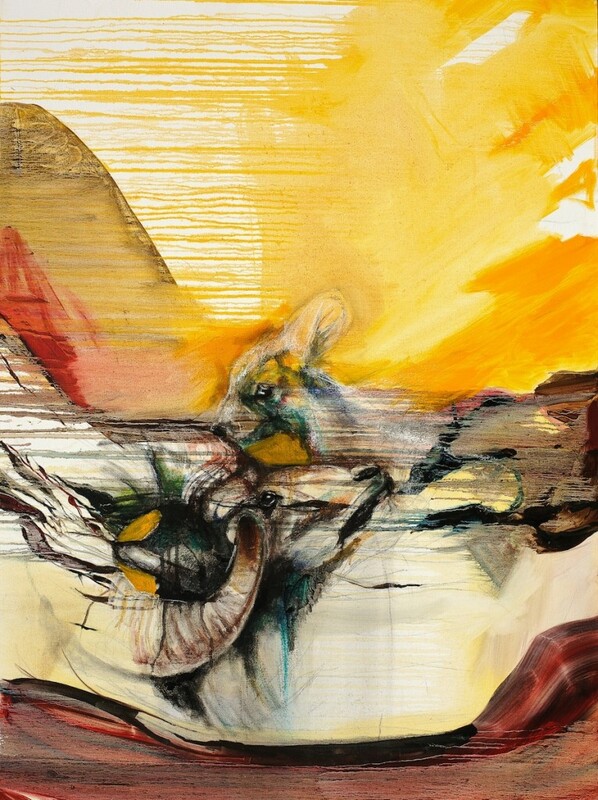 My paintings are multi-layered and multi-media. My husband transformed our garage into my studio. The walls are covered in Homasote, where I can staple large paper and canvas to the walls. I open up the garage door and work in the light and air of the day. I am inspired by everyday life, photographs, and stories. Usually I set out to create a particular image and then over time, will allow that image to transform into something else intirely, it is through play, chance, and mark where I find the meaning a revelation of the work. I discovered PanPastel four years ago. I used the pastels as a way to introduce my drawing students to pastels, as not only as a drawing medium but also as a gateway to painting. I incorporate the pastels in both the planning, rendering, under painting stage and then in the later ”play, improvisational” stage. As I create the under painting, I am more “drawing” with the pastels in a traditional way. As I destroy and rebuild the work, I use the raw pigments, the chaos of the powder and the engaging and raw colors to create the finished work. I have begun using the metallic pastels in my work, which have opened a new world of texture in my pieces. Are you combining PanPastel with other media? I combine PanPastel with oil paints and charcoal. I work with canvas or heavy weight paper, which can be used for oil paints. PanPastel Colors have superior color over other pastel brands. The pigments are lush and bright and give my work energy, which is within the pigment. I use PanPastel in the same way I use a brush. The grace and ease at which you can blend the colors, make and remove marks, and use the pastels, as you would paint, make them more accessible and user friendly. I have used the pastels as both a dry and wet medium. I encourage exploration of the spectrum of the medium and trying out colors which you don’t normally use. Everything. I am in awe of this world that I live in and all the people who share it with me. There are too many artists who I admire to list them here. That- the fact that I have a life as an artist. I can spend my days teaching, interacting, and creating art. I do not want anything else. Always do art first. I am a mother of three boys, I teach at the University of Central Missouri, I am an art director of a literary magazine, I show my work, travel and do residencies, and take care of my family and I will always go into my studio first, even if it means waking at 5am to get a few hours of work done. There will always be reasons for you not to practice your art making but if you are an artist, then you must practice, so do it first before anything else. I would like to keep on making art. I am very happy being an artist and I am honored when people enjoy my work. I love hiking, walking, gardening, and I read constantly. Of course, my sons keep me very busy. I just completed a residency in Japan and I currently have a show based on that experience there at the University of Central Missouri. August to September 2015, I have a solo show at Furman University, and I am part of a three-person show at Dalton Galley in South Carolina from September to November 2015. 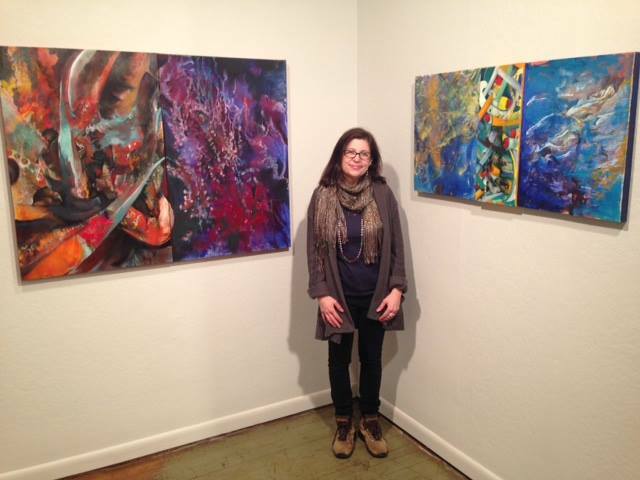 Sarah Nguyen at the opening of her show at the Kutztown New Arts Program – Jan. 2015.